We're running out of metaphors to describe the many ways that information, like water, leaks from automakers and bursts through embargoes. In this case it's a flood of pictures from the facelifted 2009 Mercedes SL, and we've got so many of them that we're tempted to start building a giant boat and filling it with pairs of animals. 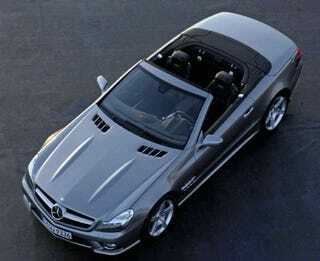 Yesterday it was just two quick glimpses of the 2009 SL 350, today we get exterior and interior photos of the new luxovert.